Tough game for the Mariners tonight. I’m so glad the Yankees won’t have to face King Felix. Whew! Glad you had fun at Safeco. It looks like an amazing ballpark and I hope I can visit someday. It always seems to me that when I’m at a ballpark, I’m surrounded by opposing fans too! What is it about that? Congrats on the win, and too bad on your loss yesterday. I hope you guys play hard against the Yanks, it would really help us out! 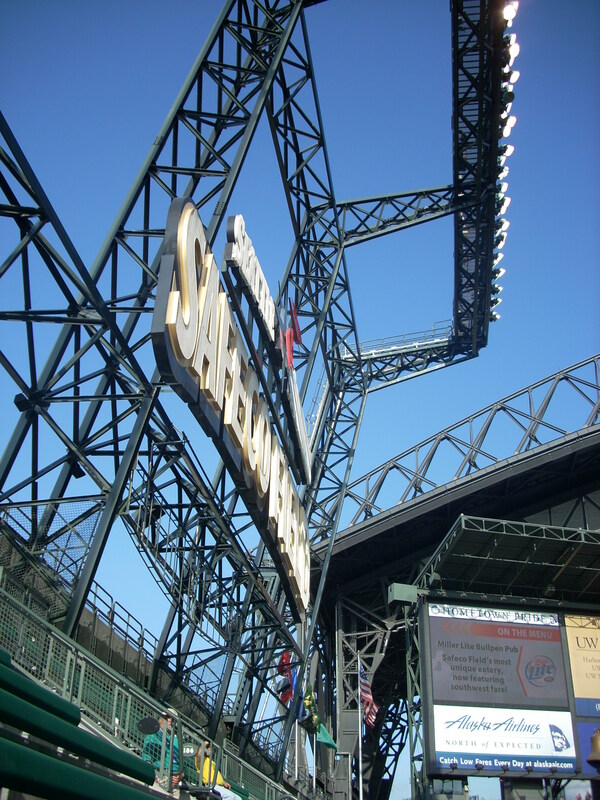 Thank you for sharing your memories at Safeco Field. It is good to know that you are enjoying yourself in that nice retractable roof stadium. I wonder why other spectators pay attention to the food selection, I find that quite strange. Anyways, have fun in Seattle. Drinking beer, well be careful about that too. The pictures are so cool. I never have really see the Mariner’s stadium. I saw the Mariners play the Red Sox last month, and it went into extra innings. Unfortunately for us we lost but, it was a close game. What’s the scoop on Chris Woodward? Is he good? Now tonight of course your guys are going to get there revenge on the Yankees…right…. Safeco looks like a great stadium. I’d love to go there some day. I don’t think I’ll be ordering the fried clams, though. YUCK! And the beer move was a smart one. You don’t want to miss out on one of the few trips you get to make to that great ballpark. Glad you had fun. Here we go again with another match-up between our teams. So far the Yankees have had the upper hand, but we’ll see what tonight brings. Can’t wait! I’ll say it again….I love Ichiro. I always like to talk about food. The clams and chips should be served at Dodger Stadium. They look pretty good. The beeer at Dodger Stadium is $12 a cup and people come back with one in each hand. No wonder there are so many people drunk. How can they afford that?? Safeco looks like a beautiful ballpark. Oh, and if I have half a drink, I turn bright red from chest up. Not very attractive!! I saw Iciro up close during the World Baseball Classic. He was awesome. oops, I meant Ichiro. Can’t spell. Sorry. Good win for the Mariners today. Ichiro is an absolute hitting machine!